VATICAN CITY (CNS) — Jesus’ call to be the salt of the earth is a reminder to his disciples to preach hope and life and not be wrapped up in dogmatic conundrums, a Servite priest told the pope and Vatican officials. “We are salt that has lost its flavor if we are not resolute men, if we are not free from masks and fear. People want to receive fragments of life from Jesus’ disciples, not fragments of doctrine,” Servite Father Ermes Ronchi said. The March 6-11 retreat was held at the Pauline Fathers’ retreat center in Ariccia, 20 miles southeast of Rome. “In this sense, the enemy of fear is not courage but faith,” he said. Reflecting on the passage in Mark’s Gospel (4:35-41) where Jesus calms the storm, Father Ronchi said that fear initially drives the disciples on the boat to “almost command” God to act and save them from doom. “Be angels who free (people) from fear,” Father Ronchi told the Vatican officials. “Salt and light are not intended to perpetuate themselves but to pour themselves out. And so it is with the church: It is not an end, but a means to make person’s life better and more beautiful,” he said. “Our heart can become either God’s cradle or his tomb,” he said. 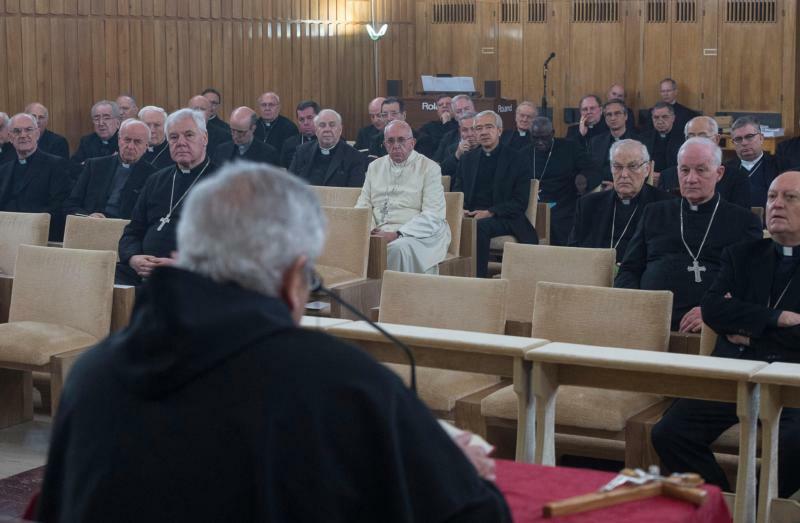 Jesus’ ordering of the disciples “to tell no one that he was the Messiah,” Father Ronchi said, extends to the church, which sometimes has preached a “deformed” perception of God and is called to preach through their own personal witness. “We clergy look all the same: the same gestures, words and clothes. But people are asking us to ‘Give me an experience of God.’ Jesus is not what I say of him but what I live from him. We are not mediators between God and humanity; the true mediator is Jesus,” he said.